We produce for Italy and abroad decostick salted finger food molds. 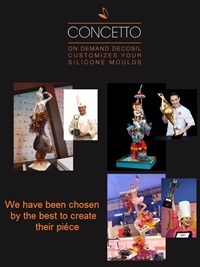 Italian leaders of silicone moulds, we create and sell for over 10 years decostick salted finger food molds, food safe silicone moulds worldwide to confectioners, bakeries and Delicatessens. and many other ingredients in snacks on stick version. Fresh fruit jellies with or without a crunchy chocolate topping. crispy coated. Mini popsicle with fresh fruit or with syrup. Chocolate and dried fruit snacks. fruit coated with chocolate or sugar.